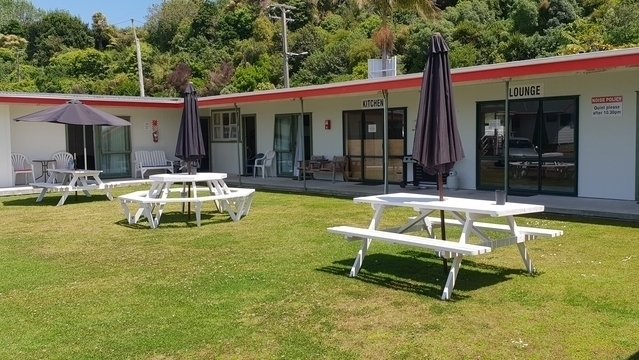 Nestled alongside the waterfront of Kawhia Harbour, our Kawhia Beachside S-Cape Holiday Park, is a small, independently-owned harbourside holiday park only 600 metres from Kawhia township, wharf and museum area. Also General store, Garage/Fuel, Craft/Art shops and Cafes. Childrens Playground and Skate Board area is situated on Omimiti Reserve in the middle of town. 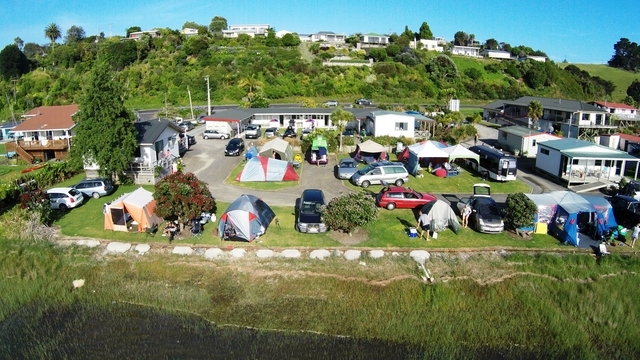 KAWHIA'S only full amenities, water's edge Holiday Park. Campsites/Motorhome/Caravan Sites: 10 power sites and 4 non-power sites. 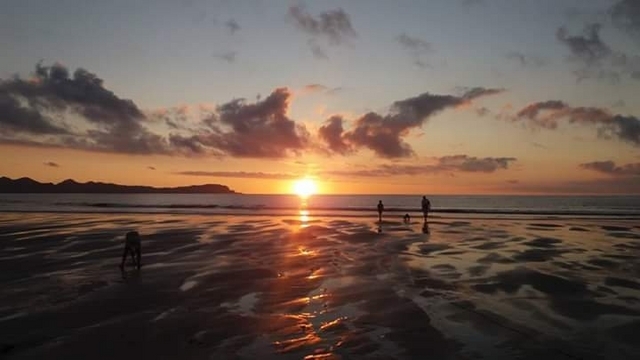 Campsites sizes are varied and we welcome enquiries. Booking numbers need to be accurate at the time of booking as space is limited. 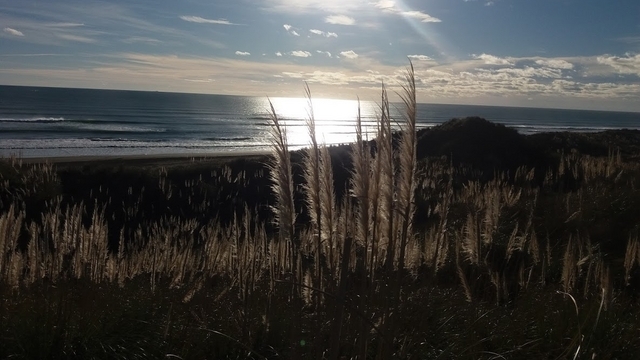 There is 4 non-power sites, which are grassed sites right on the waterfront and only suitable for a small tent and 1 vehicle. 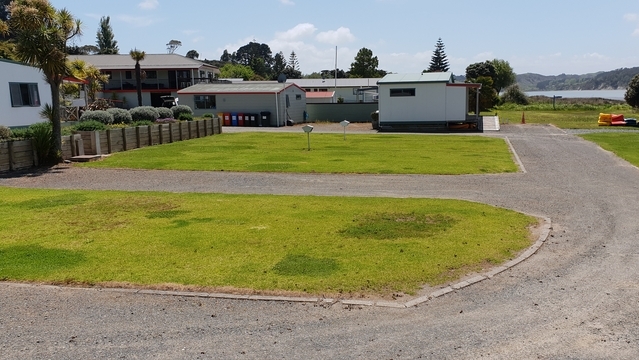 We have one motorhome/ campervan powered waterfront site and one powered garden site that is gravel, so theses sites are not suitable for tents. Please enquire if you are unsure. 1 tent and 1 vehicle. 1 caravan and vehicle per site. A short walk to the amenities. Free hot showers, coin operated guest laundry, and free WiFi. Pets are welcome in motorhomes/caravans only. They must be in owner's own accommodation and under control at all times, ie on a leash, please. Additional parking can be allocated on request. 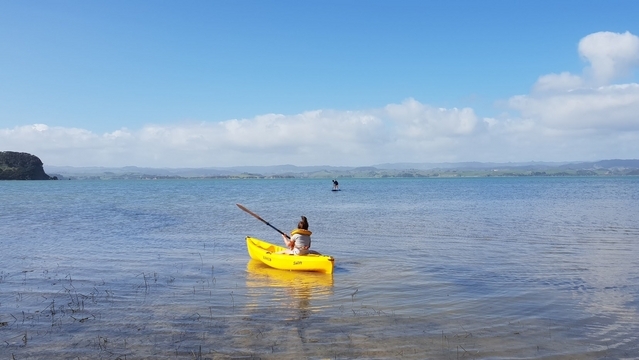 Boats can be accommodated in the campground during the quieter months, but over the very busy times it may be necessary to reserve a unpowered site for parking. 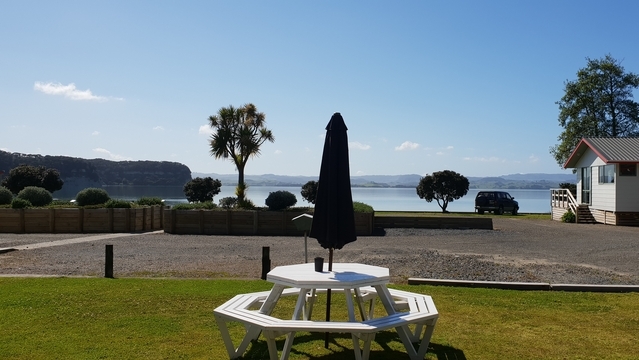 Most sites are within close proximity to the water's edge, but it is essential to Book Early, as these sites are popular and in great demand over peak seasons. 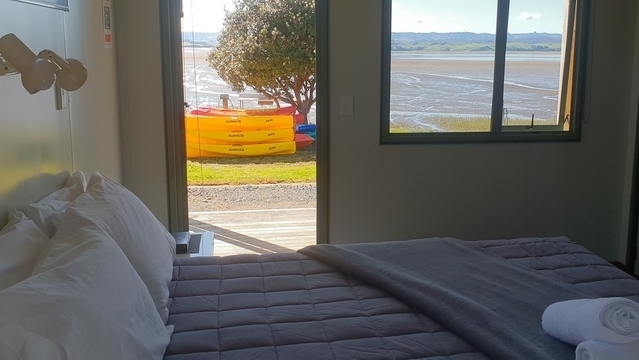 We have 9 Cabins that sleep 1-6 people, linked together forming a U-shape facing the harbour, with a large fully equipped communal kitchen, TV lounge with SKY and WiFi. Theses rooms do not get serviced. These have been fully renovated and bathrooms added. Small bench/sink, small fridge, microwave, Freeview TV, small table and chairs. Both cabins are completed with the beds made and towels supplied, compilmentary tea/coffee/milk, and tea and toast making facilities. Cabin 1 has a queen bed, a nice unit for couples. 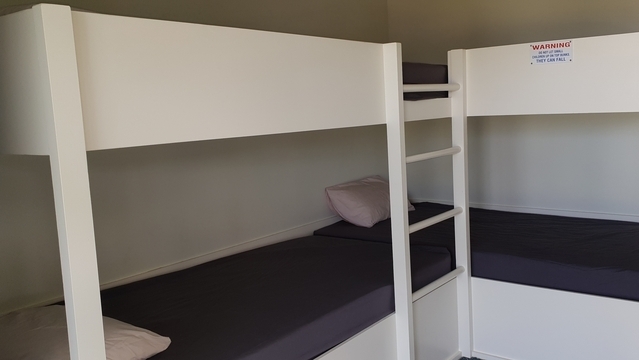 Cabin 2 has a queen bed and a set of single bunks suitable for a family. Theses rooms are comfortable for 2-3 night stays. Both with beds made, towels/soap provided, Table and chairs. Panel heater in each, both double glazed/insulated. One with a queen bed - Cabin 9, and the other with 2 king singles - Cabin 8. You use the shared amenities. Cabins are suitable for travellers/families wanting clean, economical and comfortable accommodation for a night or a family holiday. We welcome groups as well. 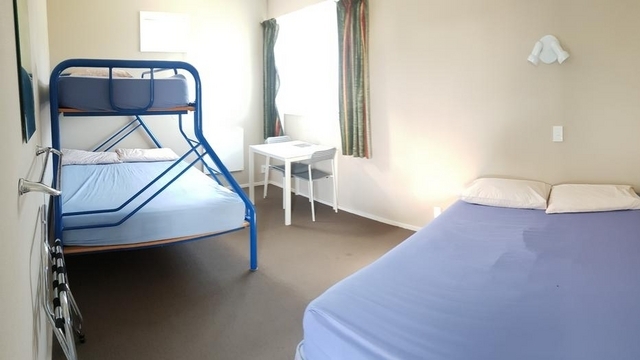 We expect groups to respect the fact that there are often families in the same accommodation. Our policy is for the camp to quieten down by 10.30pm please. Cabins are sleeping rooms only with a combination of either double/queen-size beds and bunk sets. 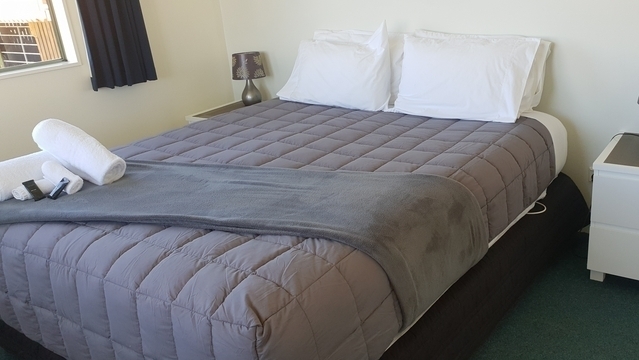 The beds have a clean bottom sheet and pillowcases, changed after each use. Each cabin does have an electric power point. 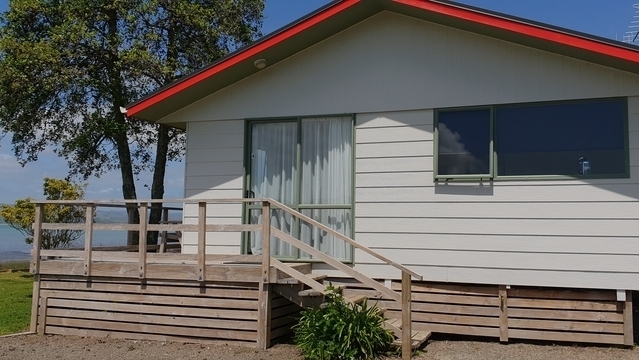 Cabins 6 & 7 have been fully renovated with insulation and double glazed glass doors. This helps keep the noise down from outside and keeps the cabins warm or cool. Cabins 3, 4, & 5 have had a repaint and tidied up. We welcome groups. We are a family camp and request guests staying in a group to respect this. 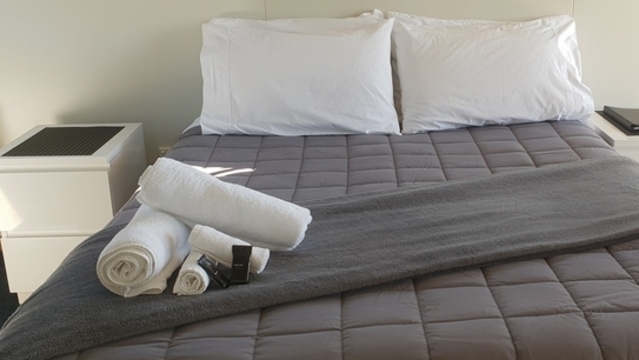 Guests can either hire bedding/towels at $5 per bed, or bring their own bedding/sleeping bags. Amenities can be accessed from a well lit terraced walkway in front of the cabins, kitchen and lounge. Modern clean ablution block with free hot showers, coin operated laundry ,and family/wheelchair accessible bathroom available. The large camp Kitchen has 3 kitchen sized stove/ovens, 5 fridges/freezers, 2 microwaves, toasters, kettles, pots, pans, crockery and cutlery are provided. There are 2 long dining tables with the old school form type seats, these can seat approximately 12-16 at each table. Please no smoking in the cabin block, but ashtrays are provided on the picnic tables. Your inspection is most welcome. These units have wonderful harbour views. Units 2, 3, 4 and 5. All motel units have electric blankets, heater/fan, and their own Sky TV decoders offering Sky Sports, Movies, Discovery and UK TV channels. All are non-smoking units. Provision is made for smoking outside only please. As much as we enjoy pets, we are sorry, that due to Health Regulations and Hygiene we request no pets in units please. 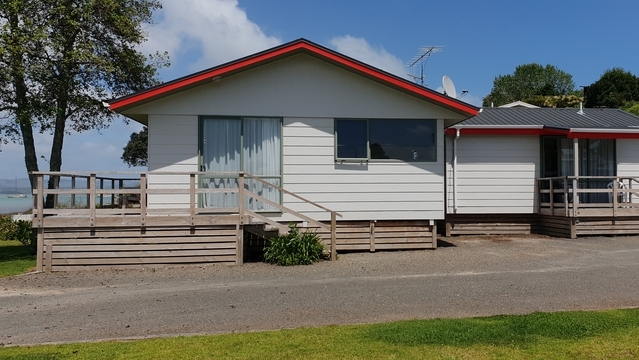 This 1-bedroom motel unit is a family unit with 1 double bed in the lounge/living area, and one queen bed in the bedroom. It sleeps a maximum of 4 people. 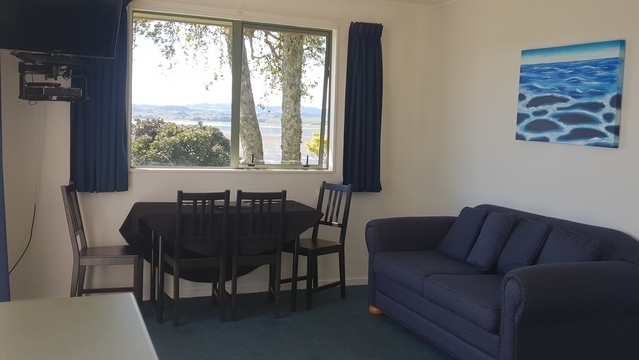 Cooking facilities and fridge/freezer are provided and this unit is suitable for multiple night stays, having a good-size table and chairs in the living/kitchen area. The bathroom is a wet-room area designed and suitable for people with disabilities with handrails beside the toilet and in the shower. As do all our motel units, the 1-bedroom unit has its own Sky TV decoder. This unit does not face the water. Water views can be seen from the kitchen/living area window. What it lacks in views it makes up for in increased size and comfort. 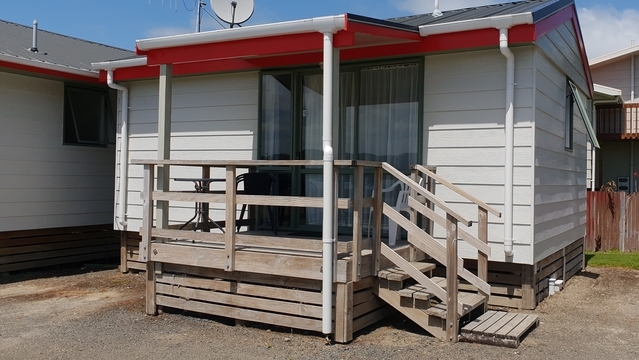 These 2 small waterfront units each have an ensuite with a wet-area bathroom, small bar fridge, bench, jug, toaster, microwave, electric blanket, heater/fan, alarm clock and Sky TV. They share a decking area facing the harbour with the water only a few metres away at high tide. With partial kitchens only, these units are not suitable for cooking other than heating microwave food. 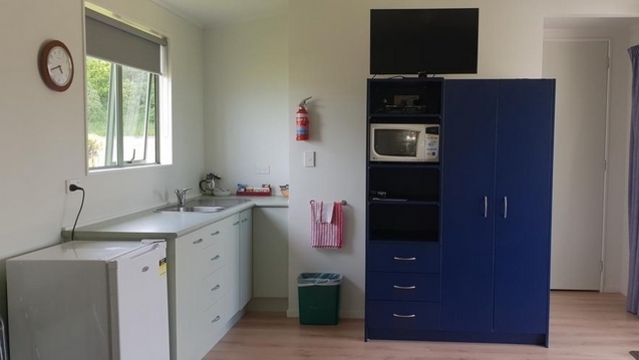 As the smallest units available, these units are more than adequate for overnight stays, but for longer stays guests may need to utilise the camp's communal kitchen or book a larger motel unit more suitable for cooking in. 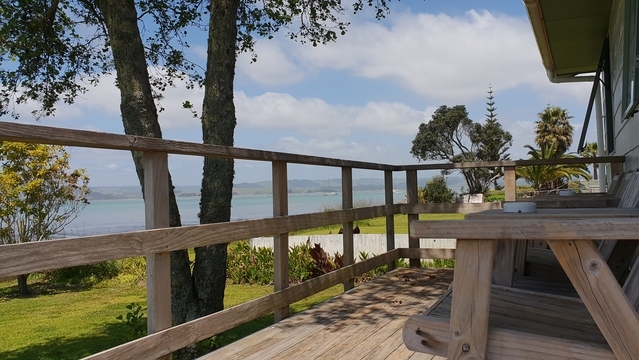 They are, nevertheless, very popular as they face directly onto the water with superb views of the harbour and surrounding hillsides. With each unit having 1 queen-size bed only, these units are for singles or couples only. Ideal for 2 couples wanting to spend a weekend together, but able to be independent in their own room. 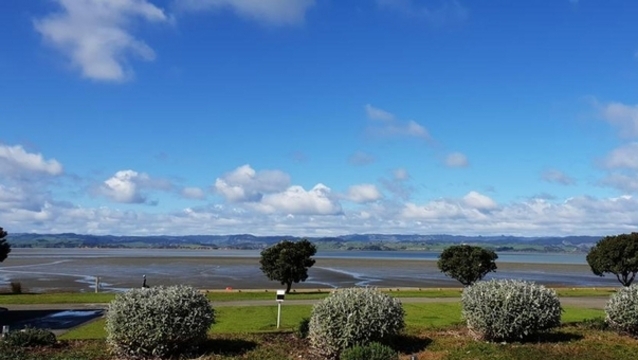 Many couples wanting peace and quiet in a tranquil surrounding choose this amply proportioned 2-bedroom fully self contained motel unit for its comfort and unsurpassed waterfront views from the master bedroom, living area and private deck. It is elevated about a metre off the ground, with 5-6 steps to climb to reach the sliding door. 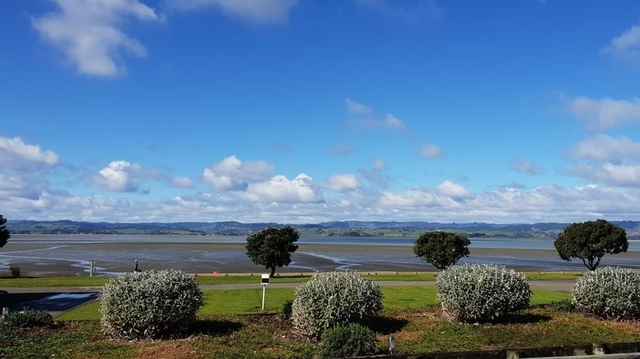 This gives it a great view of the surrounding harbour, hills and nearby campsites. Cooking facilities include a 4 hob benchtop cooker, microwave and electric frypan. Fridge/freezer and full range of crockery/cutlery etc and some saucepans and frypans. 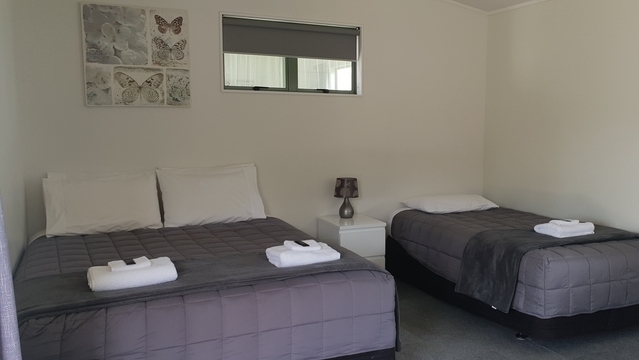 This 2-bedroom motel unit sleeps 4 people privately, king bed in master room, 2 king singles in the bedroom, and a 5th person if required, using the sofa bed in the lounge. 1 king-size bed and 1 king single bed. The large studio is a roomier unit than the 2 small studios. It has a well equipped kitchenette, small fridge and 2 ring hob for use on benchtop if required. 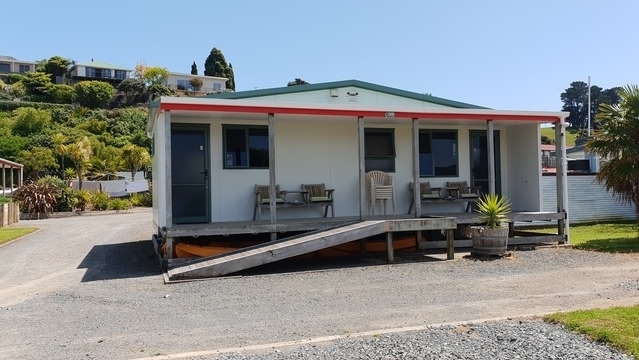 It is a stand-alone unit with its own elevated decking area with side-on harbour views.